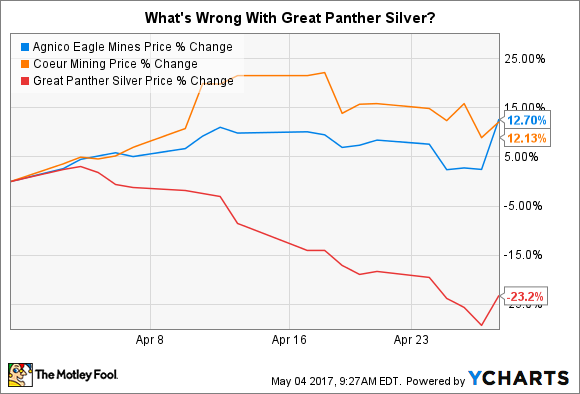 Agnico Eagle and Coeur each had a good month, but Great Panther had a disastrous one, here's what's behind the difference. The shares of gold and silver miners Agnico Eagle Mines Limited (NYSE:AEM) and Coeur Mining, Inc. (NYSE:CDE) each advanced by just over 12% in April. Great Panther Silver (NYSEMKT:GPL), meanwhile, fell a painful 23% in the month. Although the price moves were very different, news was likely the main driver of all three. Agnico Eagle Mines shares saw the biggest jump toward the end of April after it released first quarter results on April 27. The company reported earnings of $0.33 a share, up from $0.13 in the year ago period. There were a combination of factors behind the improvement, including lower costs (all in sustaining costs were 7% lower year over year) and higher realized precious metals prices. However, the biggest takeaway was really an increase in production that led management to increase its production guidance for the full year. That suggests that 2017 will be better than originally expected. Image source: Agnico Eagle Mines. Coeur Mining's most notable price jump came early in the month after it released first quarter production numbers on April 6. The news was a little bit of a mixed picture, with one very important positive. For example, production at four of the company's five main mines was lower in the quarter. But the production increase at that fifth mine, Palmarejo, was nothing short of impressive, advancing 25% over the fourth quarter and 86% year over year. All in, production was down 8% sequentially from the fourth quarter but up 14% year over year. The miner maintained its full-year production guidance. When earnings were released on April 26, the miner's shares had already priced in good news. The stock rose, but not by much. That said, Coeur earned $0.10 a share in the first quarter compared to a loss of $0.14 in the first quarter of 2016. The biggest takeaway from this pair of news releases is that, as hoped, production growth at Palmarejo is offsetting weakness elsewhere in the portfolio. Great Panther Silver, on the other hand, didn't have that kind of good news. When this precious metals miner reported production numbers on April 11, the best it could muster was that it believes it will still be able to meet its full-year guidance. The problem was the planned shutdown of a processing facility, which led to a massive 28% year over year production decline on a silver equivalent basis. Sequentially from the fourth quarter the decline was 18%. Earnings of $0.02 a share reported in early May were obviously muted compared to what could have been if the processing plant wasn't shut down. In fact, notably higher realized silver prices were what really saved the bottom line. Realized silver prices were 19% higher year over year and up 29% sequentially from the fourth quarter. That said, Great Panther didn't actually stop mining, just processing what it mined. Assuming that the upgrades work as expected it's reasonable to expect production to pick up throughout the rest of the year. Agnico and Coeur both appear to be doing reasonably well from a production standpoint. That's definitely good news, to which investors appear to be responding positively. Clearly, precious metals prices will be the ultimate driving force here, but that doesn't mean you should overlook what's going on at the business. And on that front, the news is encouraging. That's the exact opposite of what Great Panther is facing right now. The planned shutdown of a processing facility had a huge impact on production. Although management suggests that production will pick up through the rest of the year as the processing plant starts up again, it isn't fully operational just yet. Investors will want to watch for more updates here.